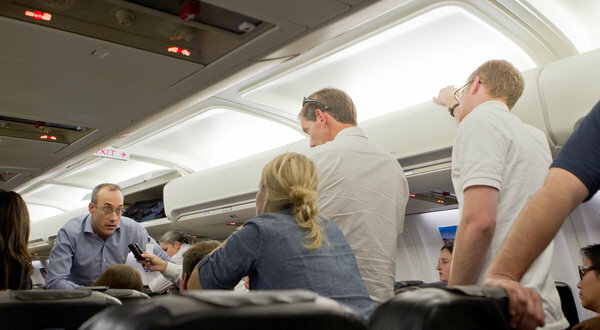 Dan Senor, left, a leading campaign adviser, at a briefing on Saturday for the Romney campaign on the plane en route to Israel. WASHINGTON — Moments after making remarks in Jerusalem about Middle East culture that enraged Palestinians and undermined the public relations value of his trip to Israel, Mitt Romney looked around the room for Dan Senor, one of his campaign’s top foreign policy advisers. Mr. Senor (pronounced See-NOR) has become one of the key people shaping Mr. Romney’s increasingly hawkish views on the Middle East. A television-savvy former spokesman for the American government in Iraq, Mr. Senor blends a foreign policy background, high-volume punditry and ties to wealthy hedge fund investors in the United States to become a triple threat as an insider in Mr. Romney’s presidential campaign. His presence in the tight orbit of advisers around the Republican candidate foreshadows a Romney foreign policy that could take a harder line against Iran, embrace Jerusalem as the capital of Israel and move away from being the honest broker in the conflict with Palestinians. But his views and influence have drawn new scrutiny to Mr. Romney’s Mideast positions, particularly after Mr. Senor said last week that Mr. Romney respected Israel’s right to pre-emptively strike Iran’s nuclear facilities. Campaign aides conceded that Mr. Senor got “a little ahead” of Mr. Romney on Iran, but said it had not diminished his role at the campaign. By tapping Mr. Senor, 40, as his principal adviser on the Israel leg of his foreign trip this week, Mr. Romney passed over more seasoned strategists, some of them veterans of the Middle East peace efforts that have bedeviled presidents and diplomats for decades. The plan for Mr. Romney’s overseas trip called for him to mix delicate global diplomacy with high-dollar campaign fund-raising, all on foreign soil. It would take an adviser accustomed to maneuvering effortlessly through the worlds of politics, money and news media. Mr. Senor declined to comment for this article. But in Israel last week, the carefully laid plan was quickly consumed by negative attention. Gushing comments about Mr. Romney by Prime Minister Benjamin Netanyahu were initially overshadowed by Mr. Senor’s comments to reporters about Iran. When that died down, Mr. Romney’s assertion that cultural factors helped account for the wide Israeli economic edge over the Palestinians drew condemnation from Palestinian leaders. For all the furor, Mr. Senor has proved to be a resilient public figure, often finding new success after public criticism.